Boy of Summer: Kansas City Royals' Gil Meche Done For Year. Of Course. Kansas City Royals' Gil Meche Done For Year. Of Course. Baseball news Wednesday morning included the story that Royals starting pitcher Gil Meche will have surgery on his ailing right shoulder and is likely done for the season. This isn't really "news" in the sense of being surprising or unexpected or even noteworthy. Royals pitchers get hurt and miss the rest of the season all the time, it seems. It would be "news" if it turned out that the moon really was made of green cheese or if France was suddenly invaded by, say, Liechtenstein. But a Royals starter getting hurt is not news. Indeed, in the last decade, the Royals have had only 13 pitchers make 30 or more starts in a season, and have only once had more than two in the same year. In six of the last ten years, they've had only one, and in 2006, they had none at all. And that doesn't even consider quality, just quantity. Five of those 13 pitcher-seasons resulted in ERAs well over 5.00, and one of the rare seasons in which the Royals could boast two pitchers healthy enough to make every scheduled start, 2005, those pitchers had two of the four worst ERAs in the major leagues. Zach Greinke (5.90), long before he got his act together, and Jose Lima (6.99) long after his fell apart. This year, astonishingly even without Meche, they're on a pace to have three pitchers with at least 30 starts apiece. But, as in 2005, two of those three - Brian Bannister and Kyle Davies - will be among the worst pitchers in the major leagues. Bannister is an interesting guy, smart and eloquent and open minded, but for all of his respect for and understanding of sabermetrics, he can't seem to put any of them to good use. 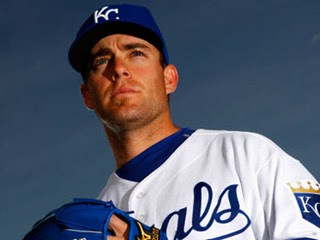 He's 29 now, has exactly one season in the majors with any characteristics you could call "good", and sports a 5.82 ERA that currently ranks 104th out of 107 qualified MLB starters. Getting 30 starts out of him is not necessarily a blessing, you know? Davies is still thought of as "young", because he's 26, even though he's been in the majors for parts of six seasons. When you talk to Royals' fans, they're always telling you how he's just shy of putting all his talent together and really having an impressive season. But at this point, it's time to acknowledge that he's amassed over 630 innings of major league service and has a 5.54 career ERA, which is almost exactly what he's doing this year. Again, 30+ starts of such dubious quality will kill any team's chances, especially one with so little margin for error as the Royals. 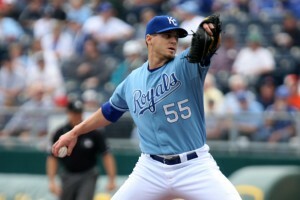 "Meche, the first upper-tier free agent the Royals signed, has battled injuries the past two seasons. He has one year left on a five-year, $55 million contract"
I'm not sure where they're getting "upper tier" from. Maybe it's like the old expression "first division", which meant nothing more than that your team finished in the top half of the league. That would be fair, since Meche was certainly better than half the pitchers in baseball at the time. But of course, saying that he was the first "above average" free agent they signed doesn't sound nearly so impressive. In any case, I don't think that's what the writer intended, as evidenced by the next sentence, referring to the (frankly, ridiculous) contract Meche signed with the Royals in December of 2006. I think the writer means either that Meche actually was one of the best starters in baseball or at least that he was paid like one, which he was. But looking back on that winter, it's hard to say that he was really in the "upper tier" of free agents. ESPN had him ranked 13th overall in their Free Agent Tracker, but he was just 7th among 15 starting pitchers, decidedly mediocre amongst a pretty weak class. And for that matter, even that ranking seems a little generous in light of some others on the list. Meche had gone 43-36 with a 4.75 ERA in a pitcher's park (adjusted ERA 8% below average) in the previous four seasons with Seattle, including 113 starts and three relief appearances. In one of those four seasons he missed several starts due to some injury or another. In another season he spent about a third of his time at AAA. In none of them did he amass more than 187 innings in the majors. Even the Elias Sports Bureau, with its flawed and arcane ratings system, did not consider Meche in the "upper tier". He was a Type B Free Agent that year, meaning that he was in the 30th to 50th percentile among starting pitchers in their rankings. Meanwhile, Jeff Suppan, the consummate LAIM, had gone 57-37 with a 4.01 ERA (109 ERA+), had never made fewer than 31 starts or amassed fewer than 188 innings in any of those same four seasons. ESPN ranked him 27th. He's about three years older, I'll grant you, but for all intents and purposes, was also a notably better pitcher at the time. He ended up with a 4-year, $42 million contract from Milwaukee that was also criticized at the time, and rightly so, but there was little reason at that point to think that Meche would give more value over the next several years than Suppan. Greg Maddux, much older than both of them at 40, had gone 60-51 with a 4.11 ERA in that span, never making fewer than 33 starts or amassing fewer than 210 innings. He was ranked 26th. Tom Glavine was 20th. Barry Zito, coming off six consecutive years of 34 or 35 starts, 210+ innings and (usually) 15 Wins, including a Cy Young Award, was ranked 15th, two spots lower than Meche(!). Clearly someone at ESPN, probably Keith Law, has some curious ideas about how to do those rankings. Nevertheless, Meche was paid like an upper tier free agent, his $55,000,000 deal ranking second only to Zito's deal for $126M that winter in total dollars for a starting pitcher, and only Zito and Dice-K got more years. The Meche deal was widely panned at the time, by almost everyone. Meche had some talent, no doubt, but he had a fairly lackluster career to that point, a penchant for injuries, and at 28, was not exactly young anymore, though admittedly neither was he old. To call his track record "spotty" is to give a bad name to Dalmations. He missed the second half of the Y2K season with a "dead arm", had shoulder surgeries both before and after the 2001 season, and didn't make it back onto a major league pitcher's mound until 2003. When he did, on the merits of simply staying healthy (if not actually good) he won the un-coveted Comeback Player of the year Award. In 2004 he was still healthy, but even less good, and made only 23 starts in the majors (along with 10 more at AAA). In 2005 he amassed only 143 innings due presumably to various ailments and ineffectiveness. Then in 2006 he (sort of) put things together, tallying a winning record for a team that frequently lost, and setting career highs in innings and strikeouts, all in his walk-year. That set him up for a big payday, and who better than David Glass and the Royals to provide it? Maybe they were foolish and just got lucky, or maybe General Manager Dayton Moore really knew something that nobody else did. Certainly if the Yankees had any inkling that Gil Meche would be worth 9.4 WAR over the next two seasons, they would gladly have given him $55 million, the second half of the contract be damned. Seriously, that's only nine million more than they paid for the rights to and contract of Kei Igawa, who's been nothing short of a disaster. What is certain is that by any objective analysis, the Royals had no right to expect much more than what Meche had previously provided: i.e. about 180 innings per year of slightly below average work. What they got instead was, if not spectacular, at least an above average, 210-inning workhorse, for the first two years anyway. It's tempting to point to one game - like the complete-game shutout he pitched on June 16th 2009, in which then-manager Trey Hillman left him in to throw a career-high 132 pitches, or the 121-pitch outing he had a couple of weeks later, AFTER he complained of a "dead arm" - but really he was fumbling and stumbling even before that. He'd allowed more than three runs in a game only 10 times in 34 starts in 2008, but by the end of May 2009, he'd already done it seven times in 11 starts. That included poor outings against the Tigers and Orioles, who would finish 10th and 11th in total runs scored in the 14-team American League, not a good sign at all. Still, when he threw that 132nd pitch, his record stood at a respectable 4-5 (for a team that was 29-34) with a 3.31 ERA in 84 innings of work. But he pitched in only nine more games last year, amassing an 8.46 ERA in 44 innings, and was done for the season by the end of August. This season he started out on the DL and usually pitched badly when he did, before finally being shut down for the year. It's worth noting that on the one occasion that he actually pitched well, he was left in for 128 pitches in a losing effort against the Texas Rangers on May 8th. And this, despite the fact that Ned Yost had some relievers available, having only used Kyle Farnsworth the night before, for one inning, and nobody else. So Trey Hillman isn't the only Royals' manager capable to incredible myopia when it comes to pitchers' arms. "I imagine it will be some type of cleanup in there with the scope. He still has irritation. It's not getting better. We're probably looking at scoping it somehow and getting him cleaned up and having him ready for next year." Well, it's nice that there are still managers out there with a little imagination, don't you think? What would be even nicer, if you're a Royals' fan, would be if the GM had a little imagination. it would not have taken a ton of the stuff to figure out that they had gotten more than they bargained for out of Meche in the first two years of that contract, that the team was not on the cusp of contention just yet, and that therefore Meche was one of their most marketable commodities. That was written in October of 2008, when the Royals inexplicably traded Leo Nunez, a young, useful, talented and cost-controlled relief pitcher, for Mike Jacobs, an arbitration-eligible DH/1B who hit for occasional power and showed no other discernible skills, unless he makes a mean sandwich or plays jazz guitar or something. Jacobs predictably hit .238 with 19 homers last year, for which they paid him $3.25 million, and was released after the season. Nunez is currently the Marlins' closer, having saved 50 games with an ERA about 20% better than his leagues over the past year and a half. And has made only $2.4 million combined over that span. The Royals seem to have a knack for paying extra to lose more. Since 2003, the last time the Royals had a winning record, they've averaged 98 losses per season in every full year, and they're on a 95-loss pace this year, easily the worst total record in the majors in that span. the Pirates have been similarly dismal, but have won 12 more games while losing 15 fewer. The Nationals have won 26 more games and the Orioles have won 27 more, but these four franchises are in a class of their own. more than the Pirates, to win 12 fewer games. That's just staggering. Say what you want about how terrible the Pirates have been, and you could go on for a while, I know you could, but at least they know how bad they are and they haven't overspent for the privilege of finishing last every year. Only the preposterous largess of Peter Angelos and the Baltimore Orioles keeps the Royals from being the worst team in this regard. Baltimore has spent $57 million more than the Royals, though they have won a handful more games, as I mentioned. It's not that they shouldn't have traded Nunez, it's just that they shouldn't have traded him for Mike Jacobs. This happens to Kansas City a lot. They trade from their strength (young relievers, Carlos Beltran, etc.) but don't manage to get fair value in return. Or they sign the type of guy a team struggling for last place doesn't need, for too much money (Mark Grudzielanek, Jose Guillen, etc.) and then ask too much for him in trade, settle for too little or keep him and get nothing at all. And it's not that they shouldn't have signed Gil Meche (well, they shouldn't, but that's beside the point), it's that they shouldn't have looked a gift horse in the mouth by keeping him past his expiration date. And now the one bit of luck they've stumbled upon in the last half a decade had slipped from their grasp. To their credit, they've gotten something for the hot hands that were Alberto Callaspo and Scott Podsednik, and may yet trade Farnsworth, Guillen, or others, but they really botched this Meche thing, lemme tellya. The country is spelled Liechtenstein. Still a hilarious joke however. You're right, and it's been corrected. Spellcheck didn't catch it because there is a proper name spelled that way, but that's still my bad.